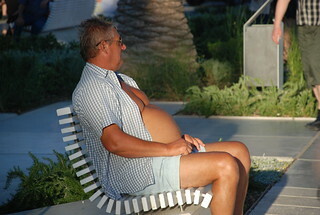 Fat man in Split, Croatia watches tourist pass by. Maybe he is a tourist, too. I don't know. What once was a six pack, is now a keg. I know from first hand experience exactly what it means to loose the six pack. People often think Americans are fat but in Croatia, I saw a lot of fat non-Americans. The fat guy reminds me of the phrase I often heard about the large financial institutions and American auto companies: 'They're too big to fail." I happen to think "they're too big to survive." Government has broken capitalism by protecting the failures. Shame on them. The reality was they they're "too big to JAIL."